Kareri lake trek starting from Dharamshala takes you to one of the most quaint high altitude shallow freshwater glacial lakes in Himachal Pradesh. Kareri Lake is a perfect offbeat trekking destination for a 3-day trek in the Mcleodganj and Dharamshala region. Why choose this Kareri Lake Trek? Kareri trek starts from Mcleodganj, about 9 km from Dharmshala. The lake is situated at a height of 3300 m above the sea level. This beautiful lake is formed as a result of the melting of winter snow from the Dhauladhar Mountains feeding water to the lake. The lake has spectacular surroundings that lure trekkers from all around the world. The Dhauladhar range remains snow covered in the beginning months of the year and the magnificent views are the chief attraction. Starting from Ghera village, the trail goes through dense Himalayan forests of Oak and Rhododendron trees, scenic valleys, and uneven terrains. Considered to be a good option for the first time as well as experienced trekkers. The trek is considered as an easy to moderate level difficulty. Kareri lake acts as the base camp for high altitude treks like Minkiani pass trek in upper reaches of Dhauladhar Mountains. Kareri Lake Trek n Kangra district is opening up in late April and remains open for trekkers until sometime in November. Sometimes snow falls even in the month of April. Weather in Kareri region remains good in months of April to June and August to October and these are the best months to do this trek. Temperature can drop around 10-degree Celsius in these months and as low as 5 C in the month of November. The best thing about trekking in Himachal is the easy accessibility to various parts of the region. Starting from Delhi you can reach Dharamshala comfortably by Volvo buses. An overnight journey and you're in Dharamshala. You will have to report at Dharmakot basecamp by 9:00 AM and you can freshen up at our campsite. Meet the trek leader and have a quick briefing session and carry your packed lunch and start the trek to Kareri village. The climb is not difficult and will take through dense but beautiful pine jungles. As you tread along the trail for 4-5 hours, you will pass by some small villages. Most of the journey involves trekking down the mountains, and only the last part has some climbing. The village you are walking towards is atop a ridge and has an altitude of around 5905 feet. Reach Kareri village and if the weather permits, you would have a bonfire by the campsite while having dinner. Overnight stay at the Kareri village. On the second day, you start your day early and after breakfast, you start walking towards nature’s wonder. The path goes along a narrow mountainous river, named Liund, which will have to be crossed again and again. You will first walk on a narrow, rocky and muddy track, lined with thickly forested mountains on one side, and a river gorge on the other. As the region is not too high, you will see coniferous as well as deciduous trees along the way. It will take you about 4-5 hours to trek to Kareri lake, explore the lake and enjoy the breathtaking views of mountains, lakes and meadows. An overnight stay will be arranged nearby Kareri lake at an enchanting meadow and you will have dinner under the glimmering stars. On the final morning of the trek, you will start your day with a warm cup of tea. After freshening up, you will have your breakfast and trek back to the Ghera. You will trek down along the river and coniferous forests of firs and spruce, and as you lose elevation, the vegetation will keep becoming denser. After you lose a significant amount of elevation, tall deodar trees will start appearing, and the grass will grow lush. Note: There is no electricity during this trek, please bring your own power-bank to charge your batteries. Volvo air conditioned semi sleeper bus- Tickets will be shared 48 hours prior to the journey date. Vovlo air conditioned semi sleeper bus -Tickets will be shared 48 hours prior to the journey date. Post booking trip coordinator will contact you to coordinate the meet-up. 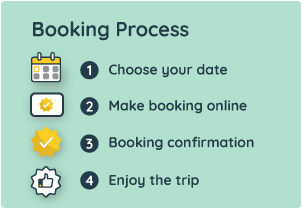 You will also receive complete information in your Booking Confirmation Voucher on e-mail and Trodly app.